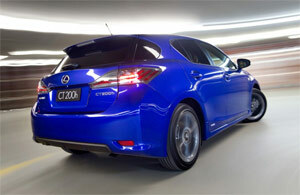 Australian website The Motor Report has published what I believe is the first english-language review of the Lexus CT 200h F-Sport package. Outside of some exterior design tweaks, the CT F-Sport is equipped with a firmer suspension — too bad the review glosses over this fact, only mentioning that might be too stiff for Australian roads. Still, it’s worth a read for a broad overview of this sport-tuned CT.
krew: It's a very good question -- I don't quite understand it myself.